What is computer? 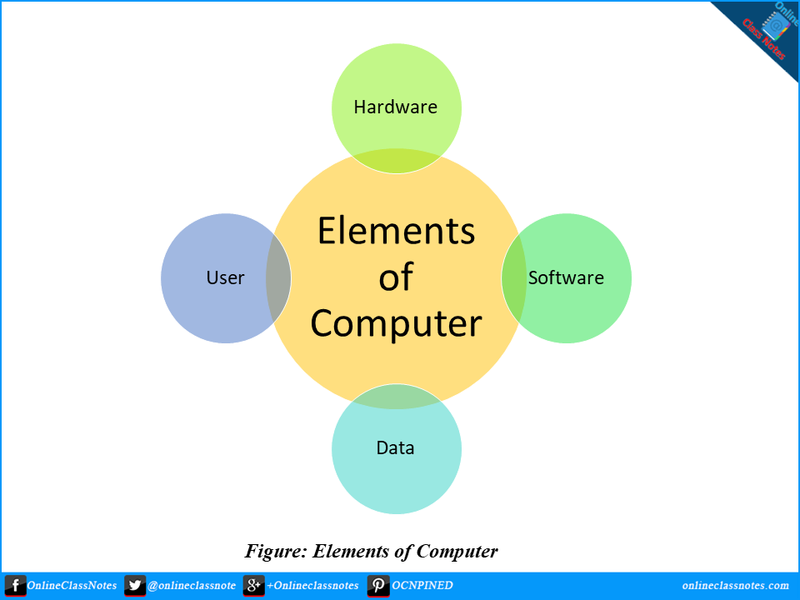 What are the four elements of computer? What are the functions of a computer? A computer is a multipurpose electronic device that can receive, store, process data and deliver information. A computer takes data such as numbers, text, images etc. as input and then process those data and converts those to useful information. Additionally, a computer can also store data and information both for future use. Also a computer can perform scheduled tasks. Computers are programmed devices. 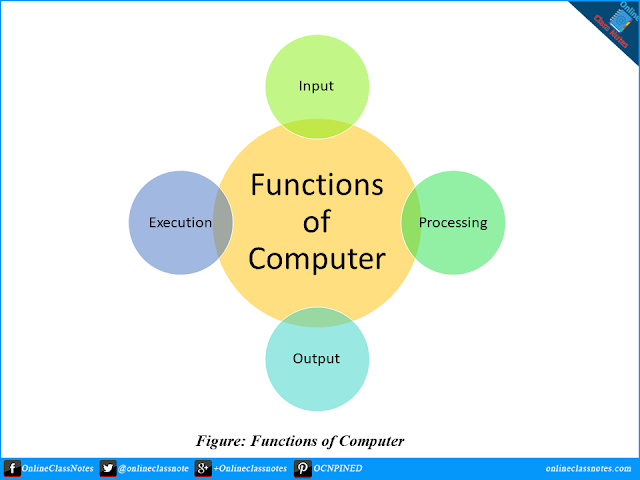 Computer programmers write programs or software for computer which actually takes input, process it and outputs information. Computer Hardware is any part of the computer that can be touched. These are primarily electronic devices used to build up the computer. Computer Hardware actually perform the computing operations along with taking input and sending the computed result as output or to storing that. Processor, Memory Devices, Monitor, Printer etc. are computer hardware. Monitor is used to display output such as video, texts etc. while Printer is used to print documents, images etc. These are electronic devices and can be touched. Both monitor and printer are output devices. Software, by definition, is a collection of computer programs, procedures and documentation that performs different tasks on a computer system. Software can specify the processors instruction through which the processor can change the state of computer hardware in a predefined sequence. Briefly, computer software is a language in which computer speaks. There are various types of software to do various tasks. Operating Systems such as Microsoft Windows 10, Word processing applications such Microsoft Word etc. as computer software. We can’t touch these as they are all virtual. But we can use them using various input devices and can get output from them using different output devices. For example, we can use keyboard to type into Microsoft Word and can see what we types in the monitor, we can also print out what we typed using a printer. Read Next: Differences between hardware and software. One or a set or multiple sets of information used in a process to obtain targeted result or goal are called data. In other words, pieces of information which by itself may or may not be meaningful but useful when connected or used with other pieces of information to form a piece of information that are meaningful, are called data. There are various differences between data and information. An information generated by processing a set of data can be used as data for another process. Data is primarily of two types, numeric data and non-numeric data. However, data can be of various types such as numbers, texts, images etc. The person who uses the computer is the user. However, beside human, another device can become user of a computer too. No only another device but also a software or program can be treated as a user. Actually, anyone or anything who or which uses, instructs or operates the computer to compute is an user of the computer. Among the 5 key parts in micro-computer, there are memory and storage devices in it for storing data and executable codes. Generally large set of data is stored in storage devices such as hard disk drives etc. When instructed, computer loads executable data from storage to memory devices such as RAM etc. and executes them. Computer executes instructions in several steps. Though a computer can be operated from stored scheduled set of instructions, but those are not general purpose computers. General purpose computers are supposed to take instructions or inputs from its users. The devices which are used to input data or signal or instruction to computer are called input devices such as keyboard, mouse etc. Computer performs tasks based on input from user along with performing other tasks which might not be required any further input or instructions. When computer finishes processing data as per instructions, it outputs the data back. However, its not obvious that the output will occur as the instruction could be to store the result of processing in storage device, or use the result of processing as input for the next processing etc. Computer uses various hardware devices such as monitor, speaker, printer etc. to output information.